At the Devonshire Recreation Club, the Devonshire Cougars and the Paget Lions played to a 0 – 0 draw. After a scoreless first at the PHC Stadium, the PHC Zebras would take the lead in the 60th minute when Jaheim Iris scored, but the league leading goal scorer Donavan Thompson would equalize for X-Road’s five minutes later. With the final kick of the game Tre Ming would stun the visitors with a bicycle kick that found the back of the net for the PHC Zebras win and remain unbeaten, while X-Road’s suffered their first defeat of the season. At Lord’s in St. David’s visitors Robin Hood defeated the Boulevard Blazers 3 – 0. Tomiko Goater gave Robin Hood the lead in the 16th minute, Shakir Smith would double the lead in the 34th minute and then an own goal in the 63rd minute earned Robin Hood the win. The North Village Rams travelled across town to the St. John’s Field to take on the dandy Town Hornets and defeated them 1 – 0. After a scoreless first half Che'kai Caisey scored in the 46th minute for the visitors to earn the three points. At the White Hill Field, the Somerset Eagles defeated Hamilton Parish 2 – 1. Ethan Fubler gave the Somerset Eagles the lead in the 23rd minute, only to have Shakeem Albouy equalize for Hamilton Parish in the 32nd minute, but Leo Burgess would score in the 79th minute to earn the Somerset Eagles all three points. At the Wellington Oval, visiting Young Men Social Club defeated the St. George’s Colts 2 – 1. Young Men Social Club got a goal from Jahki Brangman and Nique Armstrong, while the lone goal for the St. George’s Colts came from Jahmair Lewis-Trott. At Malabar, Jonathan bean would score twice for Ireland Rangers in their 2 – 2 draw with Vasco, the visitors would get a goal from Kevin Arruda and Daniel Teleman. At Lord’s in St. David’s the host would get a goal apiece from Zachari Morris and Kontai Burton as they defeated Wolves 2 – 0. 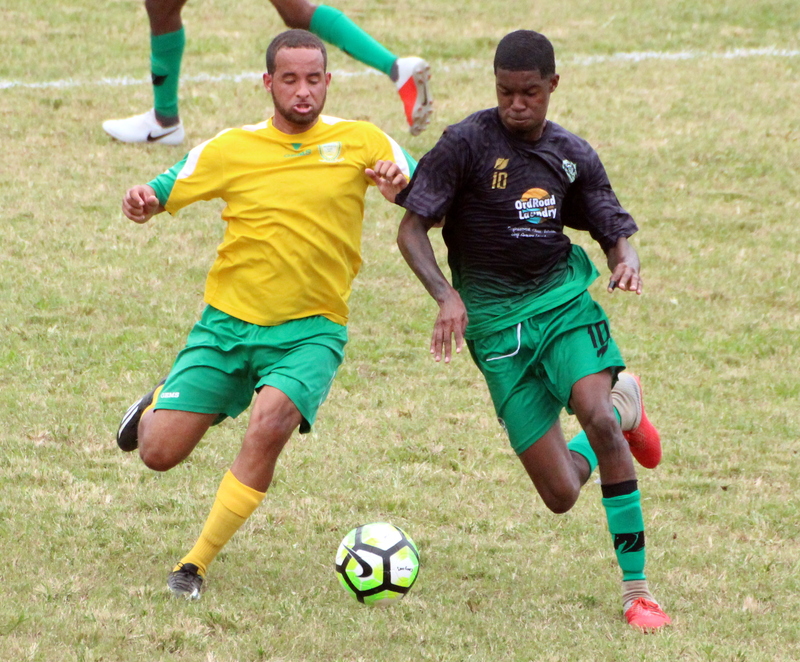 At the Police Field the Devonshire Colts defeated the Flanagan’s Onions 2 – 0, Deigo Richardson scored in the 80th minute and Chemari Henry doubled the lead on the stroke of full time.